Over the years I've also been researching the extensive Kleinjan family that originated in the Hoeksche Waard area in South-Holland. I descend from the elder generations of this extended family. The oldest ancestor is Cleijn Jan Ariaensz who lived around 1600. His son, Arijen Jansz Cleijnjan, has descendants in Mijnsheerenland, Heinenoord, Barendrecht, Rhoon and even in Volga, Brookings, South Dakota. In 1664 one of Arie's sons, Jan Arijens Kleijnjan, married Haesje Cornelisse who originated from Charlois, now part of Rotterdam. Jan's burial was registered on 26-1-1712 in 's-Gravendeel. Since the baptism records of the village of 's-Gravendeel are missing, children within the Kleinjan family that died young are unknown to us, and the links between subsequent generations can not always be proven. A possible son of Jan and Haesje was Arie Janse Kleinjan (†1713) who married Bastiaantje Floren van der Giessen (†1755), who introduced the given name Floris into the Kleinjan family. This couple had at least 2 sons, Floris and Jan, and 2 daughters, Johanna and Adriana. Adriana (±1705-1763) married Jan Anthonisse Duijser (1705-1764) and became one of my ancestors. Floris Ariensz Kleinjan (±1700-1778) married twice, as did his son Jan Florisse Kleinjan (±1740-1802), who settled in Barendrecht. Then something strange happened. Jan's 2nd wife was Lena Pieters Louter (±1754-1829), who, as a widow, married Krijn Hendriks Vermaas (1754-1825). Both had children from their first marriage. In 1807 Krijn's unmarried, 18-year-old daughter Maria Krijne Vermaas became pregnant. She said that her stepbrother Kleijs Jansz Kleinjan (1790-1869) was the father, and named the child Kleijs after him. Strangely, Kleijs never bothered to marry his stepsister. In 1803 he married another girl, and had additional issue. Being an unmarried mother, Maria was "damaged goods", but in 1814 she was finally able to marry a widower from Sliedrecht, and had additional issue, too. An elder brother of naughty Kleijs was Floris Janse Kleinjan (1769-1795) who married the widowed Jannetje Louter, who was 10 years his senior and a sister of his stepmother. Their eldest son was Pieter Florisse Kleinjan (1796-1872) who lived in Rhoon and married twice. 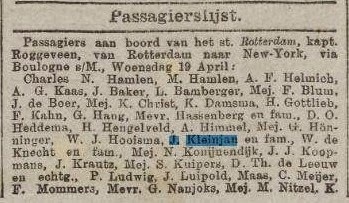 One of their sons was Jan Kleinjan (1852-1926). In Poortugaal Jan fathered 10 children with his first wife, Maria Adriaantje Huijgen (1854-1893). As a widower Jan decided to emigrate with his children to the USA. In 1893 they travelled with the steamship Rotterdam with captain Roggeveen from Rotterdam to New York. The S.S. Rotterdam II, 3,329 tons; 119,56 x 11,89 meters, speed 12 knots. Recently, my father told me a story about an American Kleinjan who wanted to visit The Netherlands shortly after World War II. Apparently, to be able to do so, he needed to own something in The Netherlands. The Kleinjan family is a family of farmers, so he decided to export 3 tractors to relatives in the Hoeksche Waard, the first tractors to arrive in that area. The money he earned with the deal was deposited on a Dutch bank, thus allowing him to visit The Netherlands. I added a notice metioning John's 1st marriage in 1878. I also added the passenger list for his passage to the USA. Hi Joan. I am one of the South Dakota Kleinjans. There have been a few other families in the USA settling in Wisconsin and Minnesota but we have kind of lost touch with them. I assume they were brothers of John's? I am going to speak with some of my older relatives and see if I can find out who visited Holland after WWII. I know that my family sent clothes and other goods over during the war to help cousins who still lived in Holland. I am very interested in visiting Holland sometime in the near future. Is there an original Kleinjan farm in the Hoeksche Waard area in Holland? If so, I would love to visit it. I have always been told that my relatives are from Rhoon...but I don't have enough knowledge to confirm or deny this. I would appreciate any more geneology information that you can add. Thank you for doing this research. If you would like to contact me directly my email is jonathan.kleinjan@gmail.com. Hi Jonathan. Nice to hear from your. The telephone directory mentions 2 Kleinjan families in 's-Gravendeel in the Hoeksche Waard area where my family originates. For Kleinjan farms I'll have to ask my nearly 85-y-old father; he'll know. The Kleinjan family indeed orginated from the IJsselmonde area, just to the north of the Hoeksche Waard, so it's a good possibility that you have relatives in Rhoon. Rhoon even has a castle, so if you happen to visit it in the future, remember to take a look at the castle, too. I'll look into the farms! Hi Joel. The only Wouter Kleinjan (Wouter is Dutch for Walter) I found in wiewaswie.nl died young, so I have no clue how your family fits in. Dellphine Kleinjan here from Nebraska. My grandfather, Peter, came from Holland when he was 14. Later married my grandmother, Florence. My father was born in 1912 in South Dakota (I believe) so I am considered one of the South Dakota clan. Nice to read your page. Nice to hear from you, too, Dellphine. Thanks, Brenda, for the additional info! For additional information, see the Kleinjan-Breeschoten-Mulder-VanderWal family tree on Ancestry.com. This is not a public tree (to protect the privacy of those still living) but relatives who are interested can contact me through Ancestry for access. The tree includes over 9000 names, and 1/4 of them are the Kleinjan branch. My goal is to fill in all names going back at least eight generations. Hi. We are obvio0usly distant relations. My name is Jacob Jan Kleijnjan (Kleynjan in Australia, where I now live). My father was Pieter Adrianus Kleijnjan. He was killed by the Nazis in Den Haag 35 days before the war ended in 1945. He was a member of the resitance.I migrated to Australia in 1956 as an eighteen year old. My father's brother,Henk Kleis Kleijnjan and his wife and 4 daughters migrated to the USA. I believe this was in 1954/1955. My descent from the Kleinjan family is far back in history - from Adriana Ariens Klijnjan (ca1705-1763). Also, my ex turned out to descend illegitimately from a Kleinjan. It's also a common name in the area where I grew up. Sorry to read that your father was killed by the Nazis so few days before the end of WW2. My father still has some stories of a Kleinjan who went to the USA and once visited his old home, but I didn't know a branch went to Australia, too. Thanks for the info!